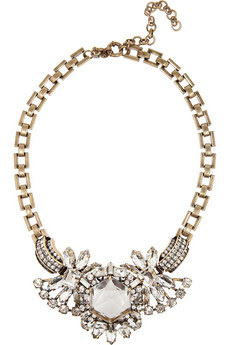 Add some statement sparkle to your look with this necklace. Whether you’re dressing up a basic outfit or styling to match an evening gown, this necklace is a great addition to any outfit with it’s slightly burnished look for a vintage feel. I think it would look fantastic with a basic white tee and pair of jeans as a statement piece. $260.